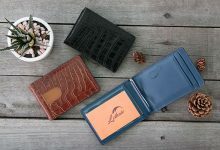 Normally, women us tend to avoid rigid wallets when seeking for a new companion because of their too masculine outer performance. 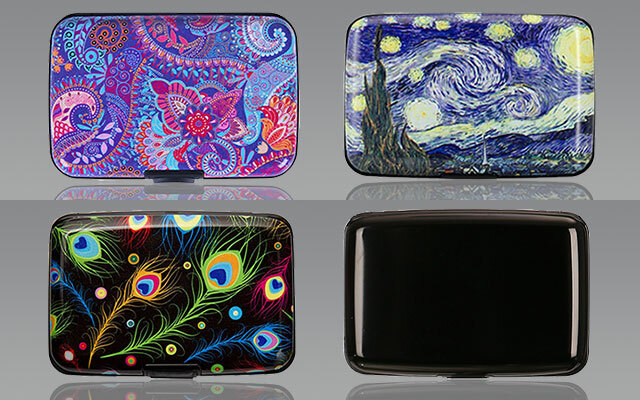 However, in fact, there are many best metal wallets with feminine and luxury look. Its shiny, squared design, on the other hand, will make you stand out from the crowd, especially in some events. On top of that, these babies strikingly stay in shape, and offer better protection for your cards. They are compact, small and concise that with a woman depends most on cards, you should try at least once. In this article, I will round up to 10 best metal wallets for women based on my personal experience and researching. Make sure you can get more chances to pick the right hard wallet as well as decide for yourself. Women who prefer carrying mini bags or handbags and need a small wallet to make a good fit can consider this Ti5. It’s strikingly thin and small, roughly 3.4 x 2.2 x 0.3 inches. 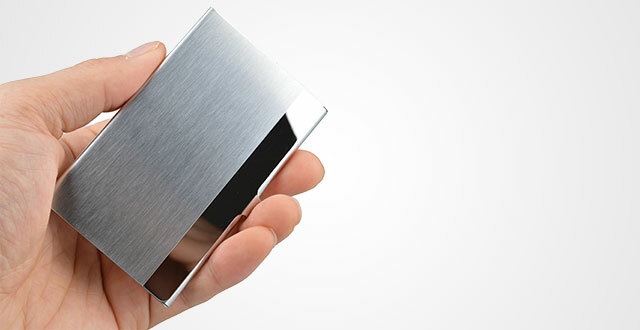 You can even hold this titanium wallet in the palm of your hand easily and very neatly. Though its compact design, the elastic band allows you to fit up 7 cards and some bills. Actually, this wallet has a minimal silhouette combining with tactical orientation. Its construction is truly simple, including one corrision proof aerospace grade titanium piece and one band. But it’s convenient and functional. There is a hole in the metal piece which you can utilize it as a smart thumb strap for quick access your cards or a bottle opener. Another good thing is its built-in RFID Blocking Technology. Besides, this is one of the best slim wallets figures super lightweight and durable to definitely serve you for years. 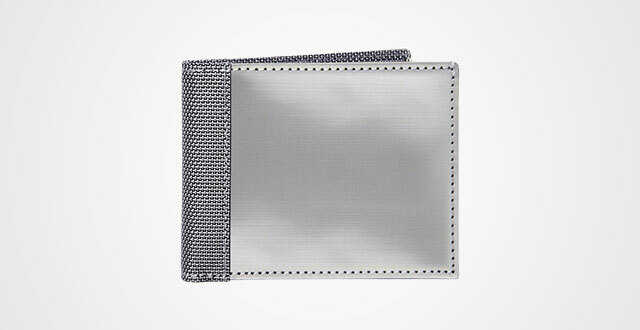 Leverage your outfit with this stylish Shell-D Aluminum Wallet. For those who don’t know, the world outside is getting crazy for this small piece. Look at it! A whole minimal shiny squared design, perfect to hook the surrounding eyes. There is a lot of color choices for you. And it just comes up with 4.3 inches long and 3 inches wide, very compact and small. 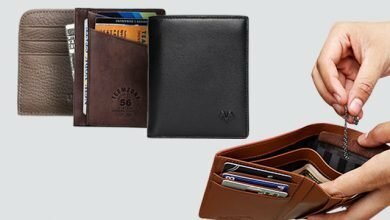 You can hand it neatly in the palm of your hand, or keep it in your jacket pocket, or in your handbag, wherever it stays, this wallet will surely not take much area. If you have heard about hi-tech thieves, you should also know that they are more and more now. And I sincerely advise you to pick those RFID Wallets to prevent your personal information against those bad guys. Luckily, this Shell-D is one of the best metal wallets for women is attached with the advanced RFID Blocking Technology that can block both 125 KHz and 13.56 MHz Signals. Thanks to this feature, you can peace in mind to go wherever you like, from traveling to daily using, from the public transportation to any crowded places. It’s functional! I do love its curved corners as this won’t cause any damage to my clothes. Besides, when opening it, it fans out the cards and is very easy to take the wanted one. This USA-based Flipside Carbon Fiber Wallet is hot like hell recently. Made out of aircraft grade aluminum alloy and powerful high-quality polycarbonate, figure curved-corner shape, nicely embossed brand logo in the front and its rough texture creates a catchy, fashionable and modern outlook. Besides, its dimensions are as appropriate as the Shell-D, 4.2 x 2.8 inches to easily handheld or stay in handbag without feeling bulk. But in terms of capacity, this Flipside is more spacious. It can fit up to 10 cards and a couple of cash inside two major compartments. Another good is thing is its closure and ultimate protection. 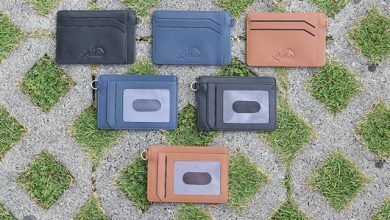 Traditional bifold wallets are usually widely opened in our handbag, which is annoying and risky for the inner stuff to fall out accidentally. But this Flipside doesn’t. 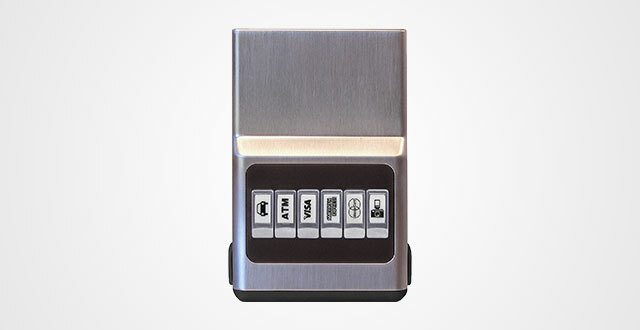 It only opens when you push down the lock otherwise, the wallet is automatically closed securely. Ready to play with colors? 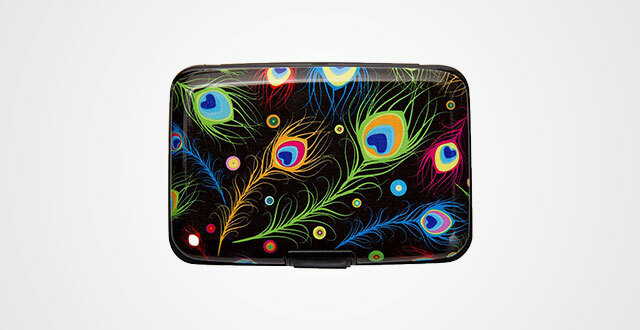 This eye-catching wallet can either make you stand out from the crowd or a good topic to begin a good conversation. There are 24 sleek designs to meet different tastes. Its premium ABS plastic material helps a lot to keep the shine last longer, cut off the weight yet sturdy than ever. The interior is designed as a card organizer to haul out the cards clearly for quick access. There are totally 7 slots, but it can accommodate up to 8-9 cards. Or, you can utilize one of them for bills. Its lock is the same as the Flipside, durable, closure and longevity thanks to the high-quality material. Based on the information provided by Shell-D, it is measured by 4.3 x 2.9 x 0.8 inch. This is a perfect dimension to both fit your cards and handbag without any burden. It is a must-try wallet. And even if you don’t like it after trying, just return to the manufacturer as they provide 100 percent satisfaction guaranteed. These credit card cases from Fig Design Group interests me by their wonderful combination between art and a normal cardholder. 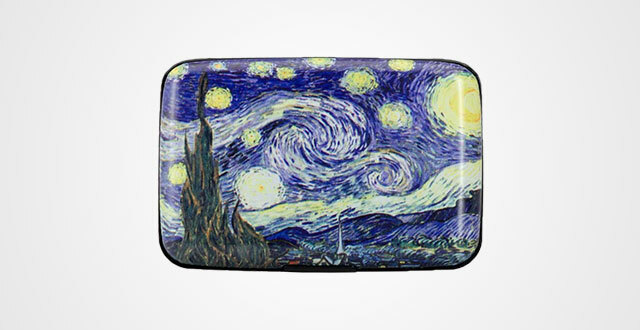 Each design brings a different masterpiece of a well-known artist like Van Gogh’s and Leonardo da Vinci. 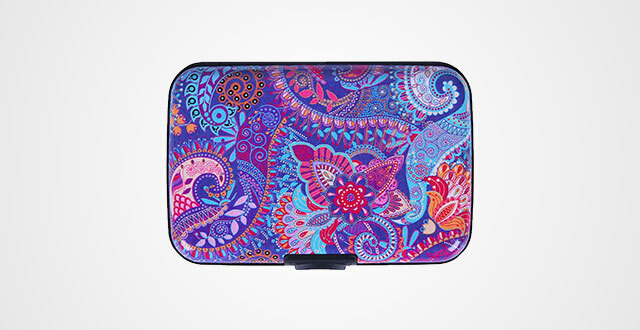 These artworks are printed onto the frontside of the cases with clear and sophisticated shape. 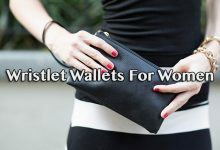 Besides, these best metal wallets for women are a great compromise of design and functionality. The capacity of this wallet is very spacious. The interior consists of 6 card slots, but each of them are roomy enough to fit up 2-3 cards. That means this compact product can accommodate up to 12 cards without bulk. 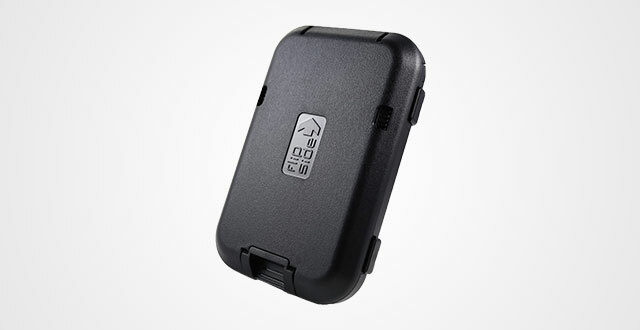 For those who are wondering, it’s measured by 4-1/4″ x 2-3/4″ x 1/2″ and also integrated with RFID Blocking Technology. In a word, I’m pretty sure that you’ll be satisfied with every single penny spent on such beautiful wallet. If you don’t like those hard case wallets featuring too…hard texture like me, let’s consider this HDE Aluminum Wallet. 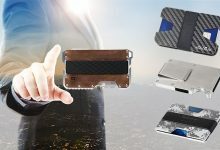 Though it’s also a metal item, the aluminum material delivers affordable hardness, which is still more comfortable if you put it in your pocket. It’s pretty concise and intuitive with the measurement of 4.25 x 2.8 x .75 in. Again, the curved-corner design makes it harmless to our clothes or body. You can hold and open it just by one hand without difficulties. I like its lock. Work very smoothly, easy to open yet close sturdily. It can fit up my vital cards with 6 slots. But I usually use 5 of them for cards and 1 for folded cash. Each slot is also roomy to fit up 2 cards without bulk. You can even store your keys here, too. Last but not least, it’s RFID Shield. This wallet is able to block any 13.56 MHz Signals to prevent any unauthorized scans and keep your private information against hi-tech thieves. Also, don’t doubt at its quality because HDE has already asserted this product with their guarantee. Give it a try and just return them without excuse if you don’t find its quality satisfy your desire. Yes, this is a little bit pricier metal wallet compared to the others. But I tell you, this is worth a try. 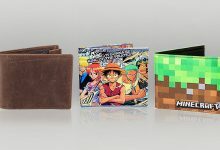 Measured by 4 x 2.5 x 0.8 inches, the wallet includes 6 slots equivalent to 6 cards. Its special construction keeps each card stay separately as well as helps to minimize the risks of damages, static, scratches and warps cause by the cards rubbing to each other. But here’s where the real fun begins, it has 6 logo icons on the frontside matching your cards in each track. It’s more convenient and interesting than the pull tabs due to its specialization. Instead of hauling out all your cards, now, with this smart design, you can quickly access the one you need. There’s no compartment for cash, but it does have a metal money clip on the backside where you can fit up some more regular card and bills. Finally, have I mentioned that this wallet is backed by a 100 percent money back yet? Another common nuisance which makes shoppers tend to avoid metal wallets is its heaviness. However, this Alumoyz seems to be an exception as it’s strikingly lightweight, only 2.08 ounces. Plus, its dimensions are roughly 3.9 x 2.6 x 1 inches. That says you can put up this wallet in any pocket without noticed or burden. 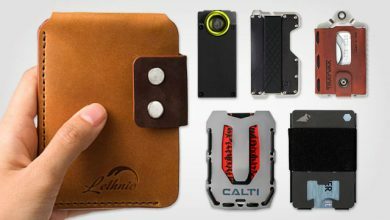 Made out of high-quality aluminum, the wallet also delivers incredible durability, flexibility and strength. It can bear hard force impacts and is not easy to get scratches or wears and tears while using. Also, the wallet keeps its shape quite well and will never rust or break, even with the money clip. Plus, the built-in RFID Blocking Technology does the thing. Moreover, Alumoyz also offers full satisfaction guarantee so that just peace in mind to try this wallet. You won’t regret it! If traditional bifold wallet is still your taste, you can give this Stewart/Stand a try. This is a crazy combination – stainless steel and the bifold silhouette. But it does work, like other normal traditional wallets. Open it, fold it, put cards in, take them out, it’s still soft, easily operated and smoothly work! Not saying that the wallet is quite lightweight, slim, durable and longevity. 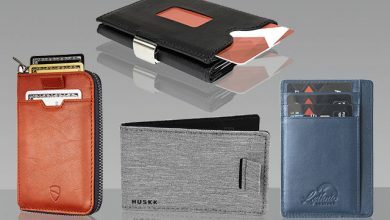 In terms of the built in RFID Blocking Technology, no worry whether it works or not as this wallet has been certificated by Certified independent lab tests (ISO 15693) and tested to prevent all 13.56 MHz Frequency Signals from unauthorized scans. It also keeps your stuff streamlined as well. There are 6 card slots, 2 hidden pockets and 1 compartment for cash. And don’t fret, the lining is thick fabric so that there won’t any friction or harms caused to your cards or paper money. 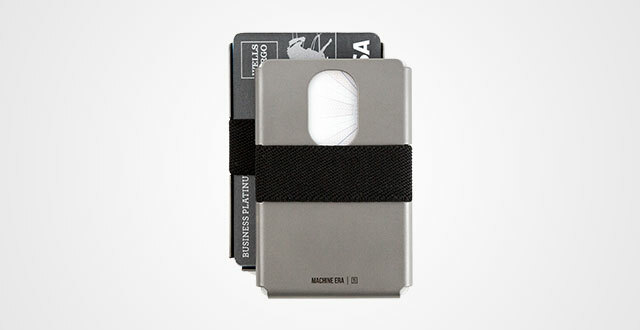 I will end this collection with the first best seller on Amazon – this MaxGear Card Holder. It has various designs to fit both men and women, some are made purely from aluminum with powerful and modern look whereas a few combines leather and stainless metal to deliver a bit classic and luxurious outer performance. But what I love about this wallet is its superb capacity. 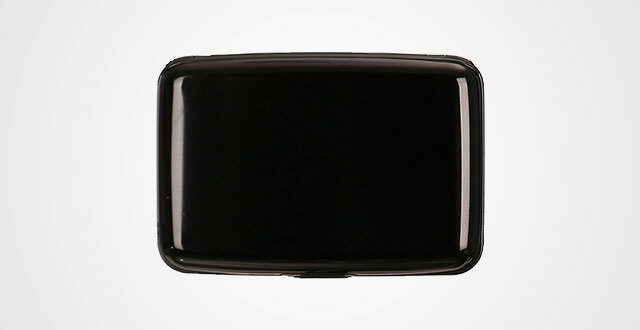 Though measured by 3.7 x 0.4 x 2.4 inches, it’s spacious enough to fit up 15-20 business cards or 8 bank cards/ID cards. With such perfect compromise of style and functionality, I think you can also use it as a present for someone, especially businesswomen. It fits any pockets, even your front pocket. Moreover, every corner is rounded to minimize the risk of causing injuries to your body or damages to your clothes. Importantly, it’s backed by the manufacturer. 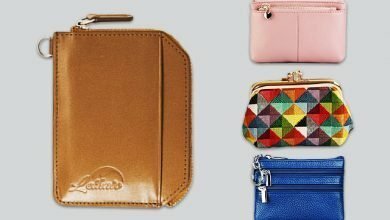 Here are 10 best metal wallets for women from what I have researched and experienced personally. Though they come up with different types, colors and shapes, in generally, they are all high-quality, longevity and backed by the manufacturer. I also keep using some of them up to now and they all hold up very well. Thus, I hope that this article also gives you more chances to find out the right companion.